This is great Brendan! It is always a challenge changing culture!! I have found when kids cotton to the benefits of this approach they want more …though some are always resistant…and they would be with traditional methods as well… Have a look at thinkbinder as well. My seniors enjoyed this online chat that allowed me to post recent resources for them to read prior to chats. Kids who missed the chat could also read chat notes. I would average half of my class and you have a choice of video conferencing or traditional chat. This all sounds like what I am interested in trying when i return to teaching in may after maternity leave. how hard is it to write the questions? I would love to see an example if you wouldnt mind sharing? Hi Catherine and thanks for your interest in the post. Firstly, I love this pedagogy shift. Secondly, it’s a brave step taking it to a year 12 class and I applaud you. I’m on my second cycle of teaching the course and although I knew I had spoon fed the first time and wanted to avoid it the second, I have pretty much fallen into the trap. And the pupils are caught in the trap with me – they just want to be told all the info rather than have a pure thirst to seek it and go beyond what’s expected (with a couple of exceptions in the boys who constantly come at me with news about the newest weightlifting super supplement). It is frustrating that their curiosity has been killed by expectation. However, I am using this method more widely with my year 10 PASS class with the hope that they take the HSC course and don’t need the spoon. I would love to hear more reflections on this as the year plays out. Hi James and thanks for the interest in the post! I’ve been thinking for a while about how the Stage 6 course is still seen by many as a vehicle to the final exam, and not for a deeper understanding of Health. I must admit, I’m a bit nervous doing what I’m doing, because it fits outside the square on many levels – the kid’s notion of “good” learning, my school’s system of monitoring “sound” HSC teaching to name two. A great project Jonesy. 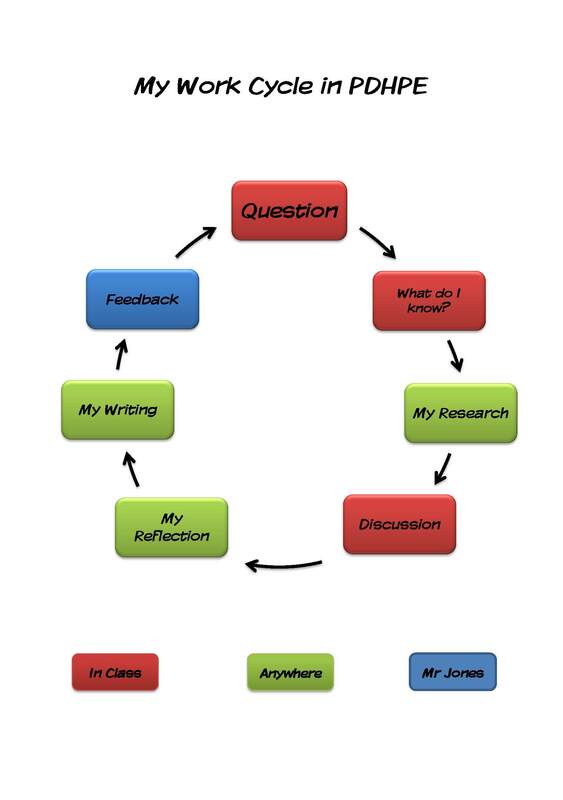 This reminds me very much of the early days of my Practiitoner Research PhD and the two steps forwards and two back that I seemed to be involved in…in fact it reminds me greatly of my whole PhD. I found it particularly useful to talk to my kids. I started with comment cards – like the ones you find in restaurants (“please tell us what you thought of your meal” – whic I left in the changing rooms and asked the kids to fill in at the end of the lesson. I asked them to write their class down and make a comment. Good, bad, indifferent was OK but it had to have a why statement as well…why was it good, bad, indifferent … I then changed my lessons based on their feedback and did a “you said, I did” sort of thing…seeing me make changes based on their feedback really helped them to buy into the ideas and the change of pedagogy. Personally, I think this is great and want to challenge myself to do something similar…just need to work out how to do it with classes of 90+. 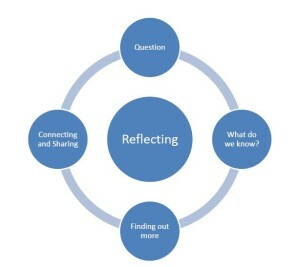 Well done Jonesey – practitioners using the process and carrying out the action learning process to the inquiry process is the best way possible to develop the various models and make the process workable – to be applauded. Hi Mark and thanks for your time in making a comment. I’m only taking baby steps with this approach at the moment, but I’m finding that the way it “works” is evolving daily. So, basically you quit the “burp-back-education” and began Project Based Learning. I am reading your blog as an assignment in my EDM310 Micro-Computing class and it seems that my professor and yourself have very similar ideas. As a student, I myself wanted to be spoon fed. I didn’t know any different and it just seemed easier to be given the answers and memorize them. Now, that I am hearing of all the things I missed out on during my education, I am beside myself that teachers just took the easy way out the whole time. I think as long as your are trying new things for your students, then you are succeeding. Yes, technology will fail, projects will go wrong, but students are still learning regardless! Great post! I completely agree with what Kaylee is saying! I really liked this post as well! I had never heard of Edmodo or Onenote, and both seem like very helpful programs. But concerning burpback education I wanted to be spoon fed as well until now in which I am in EDM310. I really like PBL and what it produces. Hi Brendan. This looks great. I was hoping you would have added to your progress later on this year to see how it has evolved. Having not taught year 12 since 2007 and preparing to embark on the course this term, I am, hopefully understandably, a bit nervous as to how to approach it. Our results are going to be heavily scrutinised as these will be our first external exams so the pressure is immense. Not having role models above them is also proving to be an issue for these students who, in general are struggling with the concept of senior study. I’d love to have the courage to do something similar to your approach, but am not sure this year is the time to do that. I would like to discuss your successes and learning from this year at some stage in greater depth.